Heavyweight value on the fluffiest fluffs! Add a fun new dimension to crafts. 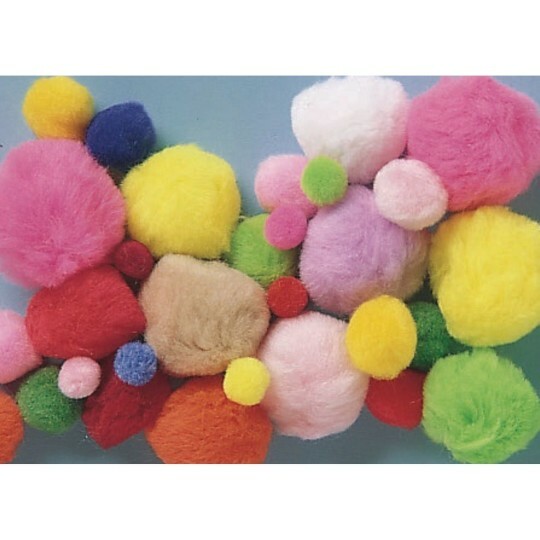 Poms in assorted sizes and colors. The right variety for all kind of fun crafts. Heavyweight value on the fluffiest fluffs! One-pound pack of Pom Poms in assorted sizes and colors. Add a fun new dimension to crafts. Used for all areas of art and craft projects. This was a great order. You get lots of Pom Poms for the money. Great variety great color good size variation lots of fun. I would recommend this. Use them all the time at school. They add anothere dimention to art. The quality of this item impressed me I've seen others from other vendors and these are of much better quality. They are great for craft projects for all ages.